Public health is the organized efforts of society to keep people healthy and prevent injury, illness and premature death. It is a combination of programs, services and policies that protect and promote the health of all Canadians. -Last, J. (2001). A Dictionary of Epidemiology (4th ed.). New York: Oxford University Press. 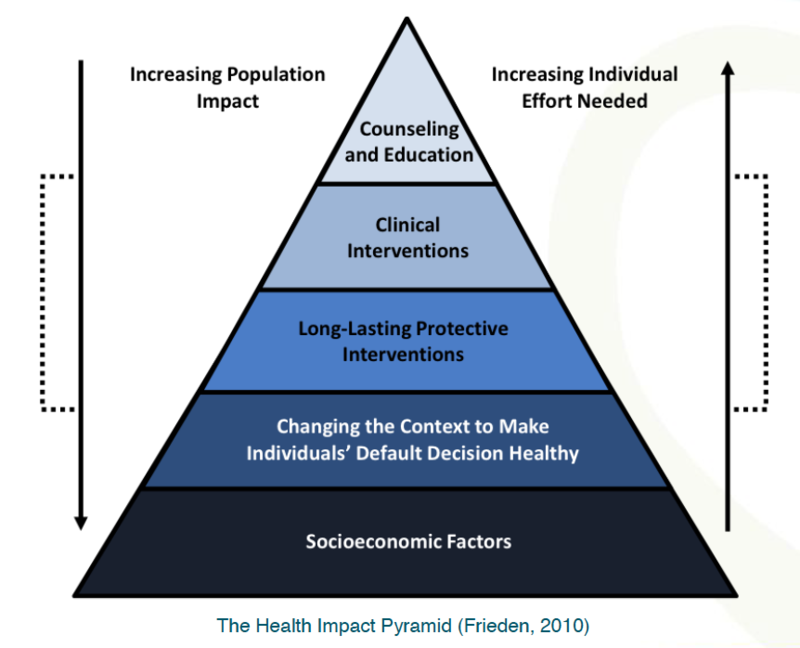 Increaing Population Impact decreases compared to the pyramid while Increasing Individual Effort Needed increases up the pyramid. Boards of health will be held accountable for the delivery of public health programs and services and achieving program outcomes in accordance with ministry published standards, protocols, and guidelines. Boards of health will be held accountable for using ministry funding effeciently for its intended purpose. Boards of health will be held accountable for executing good governance practives to ensure effective functioning of boards of health and management of public health units. Boards of health will be held accountable for achieving a high standard and quality of practive in the delivery of public health programs and services. Board of Health Strategic Plan: Sets out the 3 to 5 year local vision, priorities and strategic directions for the board of health. Performance Reports: Boards of health provide to the ministry regular performance reports (programmatic and financial) on program achievements, finances, and local challenges/issues in meeting outcomes. Annual Report: Boards of health provide to the ministry a report after year-end on the affairs and operations, including how they are performing on requirements (programmatic and financial), delivering quality public health programs and services, practicing good governance, and complying with various legistative requirements. Vision: Everyone has the opportunity for health and wellbeing.